Having loathed 1999's "The Boondock Saints," I was hoping a decade-long absence from filmmaking would somehow magically inject writer/director Troy Duffy with the needed wisdom of hindsight. A hulking shot of perspective to build a better "Boondock." Taking an eternity to follow-up his cult curiosity and dorm room staple, whatever was meant to pass for Duffy's filmmaking intuition appears to have calcified long ago, resulting in a turgid, cut-rate sequel that's surprisingly unable to best the insufferable original. The Saints have finally returned, but their fearless leader is as confused as ever. Hiding out in Ireland under scruffy hair and beards with their father Noah (Billy Connolly, the only redeeming element of these films), brute brothers Connor (an unrecognizable Sean Patrick Flannery) and Murphy (Norman Reedus) have retired their hitman ways, sticking to life as farmhands. When a priest is gunned down inside a Boston church, the boys take the offense as a signal to return to business. On their way back to America to commence the slaughter of enemies, the brothers befriend Romeo (omnipresent Clifton Collins, Jr.), a devoted fan who's eager to join the fight. As the Saints try to figure out who's behind the assassination, Special Agent Eunice Bloom (Julie Benz) has picked up their scent, leading the skittish local cops (Dave Ferry, Brian Mahoney, and Bob Marley) through an exhaustive investigation to figure out a motive, openly wondering why anyone would purposely encourage the Saints to return to town. Permitted more budgetary coin to work with, Troy Duffy strains far too hard to rekindle the lost "Boondock" chemistry, resulting in an unbearably lumbering film lacking the polish the original picture enjoyed, if only to a certain degree. The years haven't been kind to Duffy, with the 2003 documentary "Overnight" exploring his massive ego and self-destructive tendencies while the first "Boondock" was in production. There's been only silence from Duffy between the two pictures, a stillness that's paralyzed his creative development. If it's possible, "Boondock II" is a more slapdash film than its forefather. Soaked in Bushmills and schoolyard vocabulary, the film is a crude ode to the defiant Irish tough guy stance, with flimsy cursing, inane action choreography, women in yardstick-high heels, and phallic firearm symbolism that perhaps speaks more about Duffy than any of the nonsense contained within the picture. As a director, Duffy pushes the feature further than it should go, squeezing the slapstick comedy and Irish brotherhood material to a point of absurdity. In fact, most of "Boondock II" is ridiculous, but not in the lively, campy way the script is yearning to express. The spirit of the film is trapped in a bad movie phantom zone, where performances rabidly compete for screentime and the story becomes a puzzling tangle of last names and allegiances. Duffy has preserved the experience for devotees, bridging the ten years with plenty of references, cameos (most, if not all of the cast returns), and general cigarette-smoking smarm to keep fans comfortable, but the general mood of the film is oddly immobile. Even Flannery (at least I think that's Flannery) and Reedus seem a bit confused by the production, fighting to be seen alongside a manically mugging Collins, Jr. and Benz, who slaps on an atrocious southern accent and a push-up bra to recreate Dafoe's apocalyptic energy from the first picture. About the time Duffy dresses Bloom up in cowgirl gear to literalize a western-flavored showdown was when I realized that the director was too caught up in the experience, urging his idiotic style over some sorely needed substance. Being his only way to pay bills these last few years, Duffy has built an opening for "Boondock III" into the climax of the picture, so expect more of the same sometime around 2019. If Duffy manages to get the film made sooner than that, I can only hope he allows himself some breathing room to grow as a director. Because of his decade-break desperation, "Boondock Saints II" comes across cringingly rusty; a glorified fan film that only manages to make the popularity of the original picture all the more bewildering. 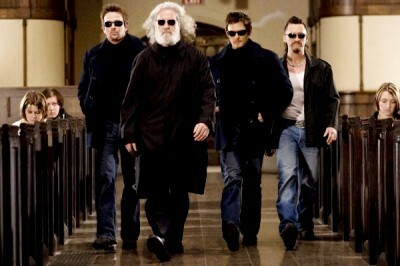 Buy tickets to "The Boondock Saints II: All Saints Day" now!